I'm not a huge fan of Sci-fi films what so ever. My friends keep telling me I would actually like the new star trek film but I will probably never watch. I made exception to see this film because of Joseph Gordon Levitt and Rian Johnson, past films together. To me there work together is much better then Tim/Johnny who seem to team up almost every other film now, for what are forgettable films. 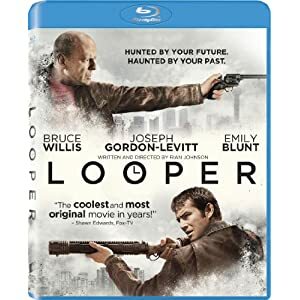 Looper is a time travel film, which always seem to be hard for directors to get right, even the 3rd harry potter film had to stumble through parts of it. I'm not saying they did a perfect job on the whole time travel story-line but they did such a good job that it's hard to point out the mistakes. This had to be one of JGL's best performances and hardest to pull off at the same time (I knew he wouldn't get nominated for anyone of the big awards but I can wish right?). The whole thing to me was great until the end.